Matt and Angellica are joined by Debbie McGee and Raphael Rowe to talk about Pilgrimage: The Road to Santiago, plus Alex continues on the Sport Relief Mother of All Challenges. treacherous Porth Yr Ogof cave. for a new BBC series. to make her own way here tonight. the way here. Nice to see you. what I was like. Lovely to meet you. of William, Kate, Harry and Meghan. Or was that just one lucky click? Twitter. To all of my 11 followers. about to see a rock band. the reality of it all sets in. and the breadth of Prince George. Making eye contact can help. trying to get her attention. Tomorrow we are against each other. first to arrive and grabs her place. get a shot if I am behind her. Look! She has got gloves on. She has to act fast. to get Prince Harry's attention. wondering if you liked it. It did. You saved my life. and get some half decent shots. picture is picked up by the press. winning shot. Who took it? This was the winning shot. grabber making money off the photo. Suzanne is the best photographer. to see Megan. So we went. start for her. Which is brilliant. on a The One Show challenge. hose. An actual garden hose. to point out that was a gag. just a few days after she was born. is this child's future going to be? for five days, he went into a coma. had to do my best to look after him. carry on. It becomes very stressful. frustrating. I cry with him. at least six years of Jeff's life. Bringing up a child with challenges. been taking part in the project? will stand and he will walk. daughter? They say it is a curse? and less dependent on his mother. like the one we have seen today. the word MUM to 70205. Debbie, can you do £20? penny makes a huge difference. From one epic journey to another. You carry your own kit? this route? 250,000 people do it. challenging, as we all did. I'm sure you will on the programme. reasons you wanted to do it? something spiritual out of it. you say that on the programme. the first hostel, what do you have? day of the mother of all challenge. letterbox and the washing machine! lack of air and a lack of space! safety briefing we are ready. of mums looks after each other. We'll be fine when we are in there. you pack the fairy liquid?! fact that I can't stand up. would have to face any more ledges. chance you can drop off the edge. Steadily we crawl across the ledge. You cannot put a foot wrong. through what is called the Toilet. mums that has helped see us through. gave it a good go. now! Good to see them smiling. between them and the finish line. Very excited about our guest. here on our green sofa. 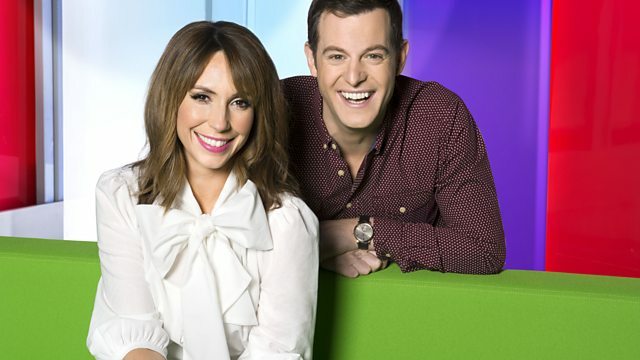 Matt Baker and Angellica Bell are joined by Debbie McGee and Raphael Rowe to talk about their latest project, Pilgrimage: The Road to Santiago. Alex Jones and her band of brave mums continue on the Sport Relief Mother of All Challenges. Plus Karen Anvil, whose amateur photo of the four young royals sold around the world last Christmas, tries to recreate her success when Meghan and Harry visit Birmingham.